MIGHTY MATH! 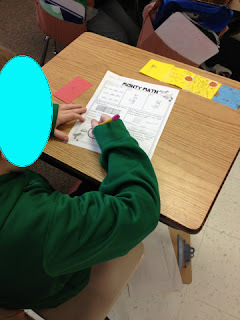 2nd Grade CCSS Weekly Math Assessments - Hippo Hooray for Second Grade! 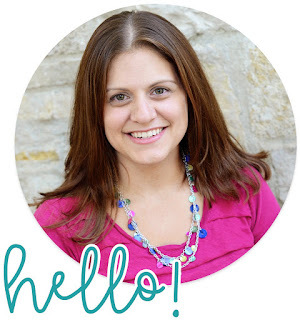 I cannot begin to describe how EXCITED I am to share my latest project with you! 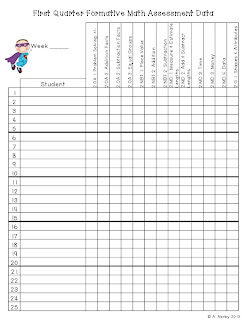 This has actually been in the making for the last six months, as I've tried it out and tweaked it in my own classroom. My self-diagnosed ADD wasn't helping either. 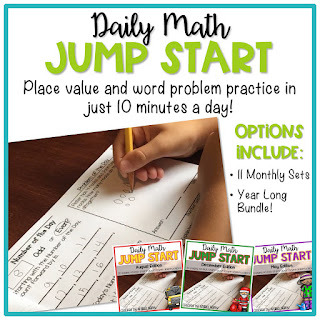 I use the EveryDay Math program, and six months ago I was a hot, frazzled mess. 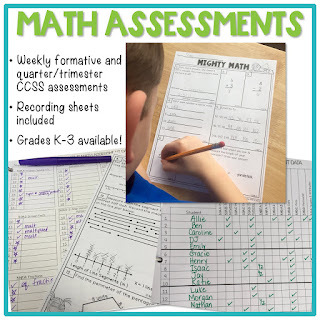 I had aligned many of the Math Boxes (daily spiral review practice) to the skills I assess on my report card, and the plan was to use them as formative assessments. 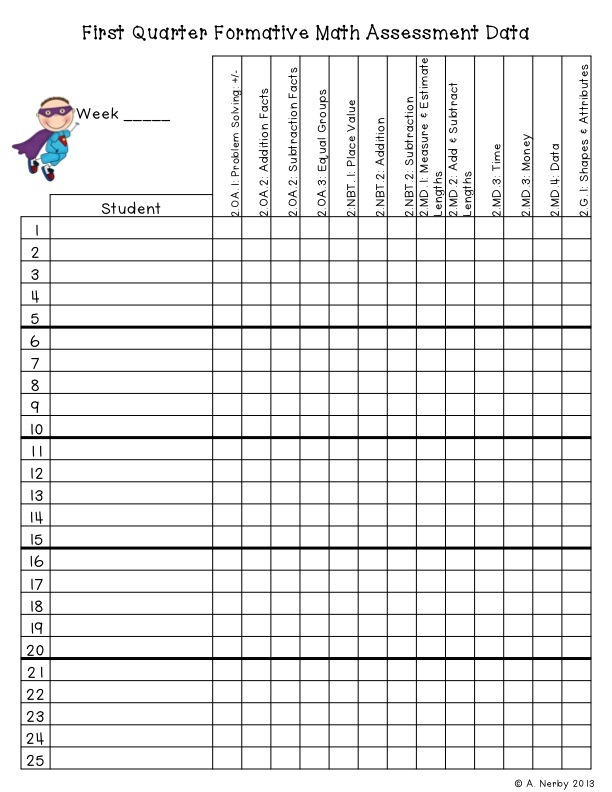 I would record my students' performances and pull small groups for enrichment or reteaching. Sounds like a good idea, right? Well, I was having a hard time keeping up with recording in my grade book part. When I see a giant stack of Math Journals staring at me, hoping I'd grade them, I will find something, anything to do instead. I tried to grade Math Boxes on the spot, but that was hard too, because I always had 5+ students waiting in line to be checked off (and of course, chatting up a storm with each other) plus 5 more kiddos asking for help. Independent work time was a nightmare! 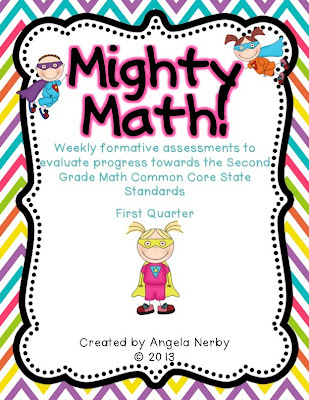 Mighty Math is a set of weekly formative assessments that I use to evaluate progress towards the second grade Common Core State Standards. 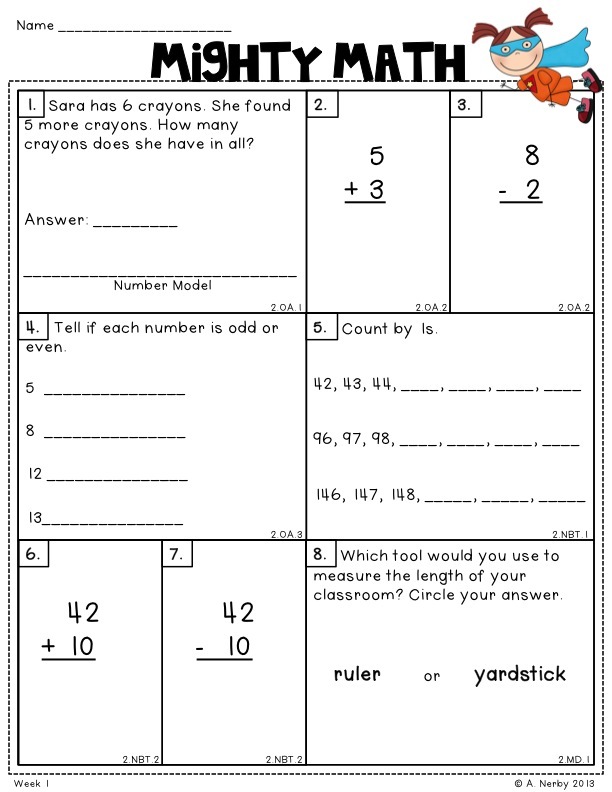 All ten of the 2nd grade math CCSS are included on the assessments, although I split three of them in two (addition & subtraction facts, larger addition & subtraction problems, and time & money), bringing it to a total of 13 problems each week. 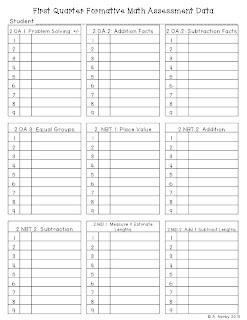 There are nine two-sided assessments that will get you through the first quarter of school. Here's week 1! I'd love to give away a copy! If you would like to win a copy, enter the Rafflecopter below. 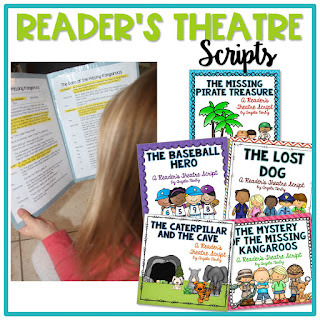 If you just can't wait, you can pick up a copy at my TPT shop. It's 20% off through Friday. Great giveaway! Looks like an amazing product! 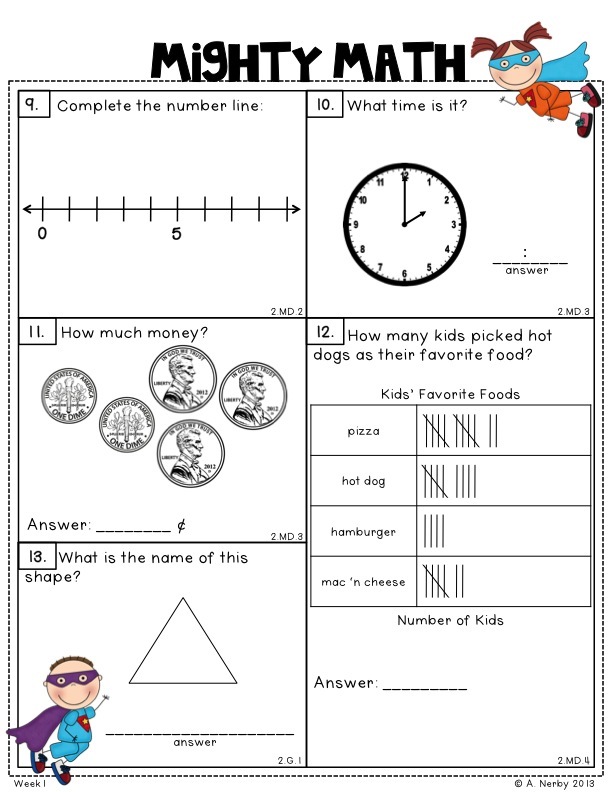 I really love your EM assessments that you created! I also use EM and in the last two years the teams I have worked on have been constantly changing each Unit test to align with CCSS (I have done 1st and 2nd). Are you finding that you are taking a lot out of EM? 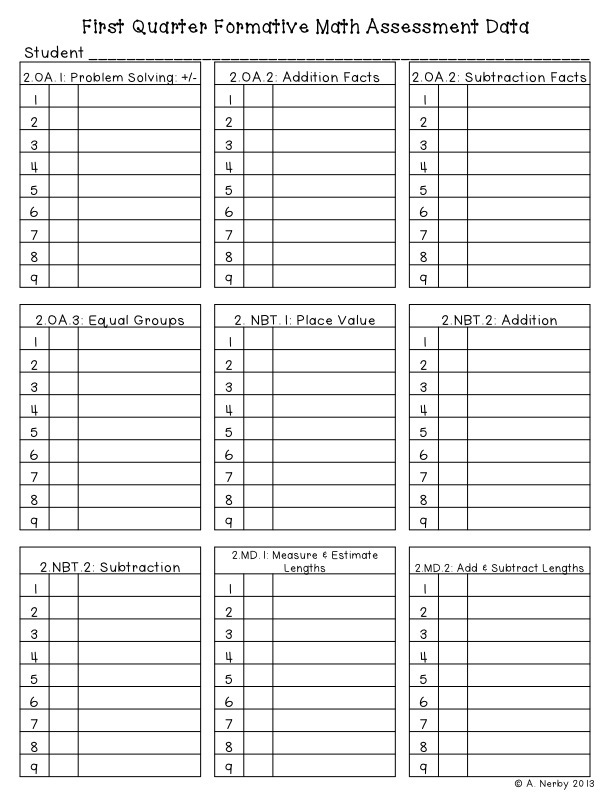 Also, I am not a fan of grading the Math Boxes....It takes a lot of time and most of the time my students aren't understanding most of the boxes until after we review in small groups! There is a free website called VLC Learning Community that has additional resources...you may have already heard of it!! http://vlc.cemseprojects.org/. 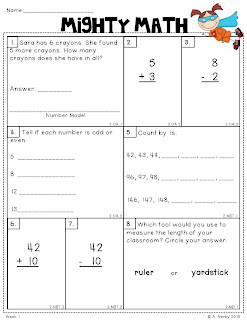 I am now going up to Third Grade, or else your EM assessments would be in my go-to files! Good luck in your upcoming year! 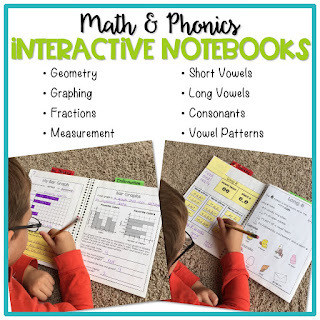 I agree that the lessons are so long in Math Workshop. Instead of teaching a lesson in small group, I tried to do a whole group introduction, then did small group to differentiate. It wasn't a true workshop, but it gave me a chance to reinforce with struggling students, enrich accelerated, and check in with students "right-there". There were a lot of snags that I plan to fix, but like you, that's a lot of cutting and supplementing. 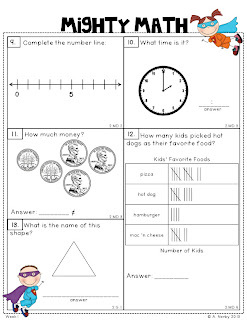 Love the idea behind your packet...always looking to work smarter, not harder! This looks awesome! I think it will be a big help when it comes to grading and conferences! Do you plan on making more for the other quarters in the near future? Thanks for all your hard work! Trust me, so helpful!! My parents are so appreciative when I can tell them specifically what their child's strengths are and what skills they can work on. Yes I am already working on the 2nd quarter! The plan is to get them all done before I go back to school (Labor Day). Wish me luck!